I'd like to present a handful of programming concepts that I find incredibly useful, all of which can be implemented in under 20 lines of code. These techniques can be used in a wide range of contexts, but here, I'll show how they can all build off of each other to produce a full physics engine in just 75 lines of code. The mix() function takes two values and calculates a value some percentage of the way between the two. It's important to implement mix() the way I've presented it, rather than a+amount*(b-a) (the "clever" way with fewer math operations) because the "clever" version is much more susceptible to floating point rounding errors when amount is 1. I've encountered this bug before, and it's a pain in the neck to debug! The mix() function is incredibly handy whenever you're combining two values, but it's also a great case of self-documenting code. Instead of height = height1 + x*(height2 - height1), you have height = mix(height1, height2, x), which is way more readable! You can also generalize mix() to mix things like vectors or colors, or even mixing between more than 2 things. Applying a function like smoothstep to amount can also give non-linear mixing. Golden ratio sampling is a technique that uses the golden ratio (sqrt(5)+1)/2 (often represented with the greek phi: φ) to generate values evenly distributed between 0 and 1, where the number of values is not known in advance. Each new value will divide the largest gap by exactly 1/φ, how cool is that?! Bonus fact: φ-1 = 1/φ. This totally blew my mind when I first learned it! It's very broadly applicable, but I often use it for generating colors with different hues, when I don't know ahead of time how many colors I'll need. Each new color falls between the two most dissimilar colors yet produced. This blog post goes into more depth. I also used golden ratio sampling when I made Hill Noise because it has a lot of really convenient properties. The paper Golden Ratio Sequences For Low-Discrepancy Sampling goes into more detail and also describes a way to generalize to 2 dimensions and even a handy technique for reverse-engineering an index from a golden ratio sample. This technique is fantastic for any time you're trying to get a value to move something towards a target. Implemented this way, the movement can have some undesirable properties. First of all, when the value reaches the target, it stops jarringly fast. Secondly, this type of movement has no sense of urgency. It plods along at the same pace, regardless of how far it has to go. This constant pace means that if the target is actively moving away at a speed higher than that constant speed, the target will get further and further away, eventually getting lost. While this might be physically realistic, it's very undesirable for something like a video game's camera attempting to follow the character. Exponential smoothing, on the other hand, addresses both of these problems and is even simpler to implement. If you're working with a variable-sized timestep and you really care about precision, the general form is mix(value, target, 1-(1-speed)**dt). Essentially, for every timestep, the value closes a percentage of the distance to the target instead of a fixed amount of distance. Doing it this way is very aesthetically pleasing, and easy to implement, so it's a great trick to keep up your sleeve. Verlet integration is a math technique that can be used for simulating physics and I think it's severely underrated. This works for all sorts of constraints, including snapping an object to your mouse, keeping an object on camera, keeping two objects attached to each other, preventing two objects from overlapping each other, and so on. Whatever positional constraints you apply, the velocities will just work themselves out to the correct values. A full explanation of Verlet integration is beyond the scope of this post, but Thomas Jakobsen did an excellent writeup for Gamasutra and Florian Boesch also has a great post addressing some issues that can arise. Collision checking is one of the most performance-intensive parts of most games. You need to know when objects collide with each other, but if you have a large number of objects, it takes a lot of time to check for every possible collision. There's some really efficient techniques for speeding up collision checking, like Quadtrees, Binary Space Partitions, and Sweep-and-Prune. However, many of these are a hassle to implement and are very susceptible to making off-by-one mistakes as you do. Instead, you can get great performance out of a very simple implementation using spatial hashing. 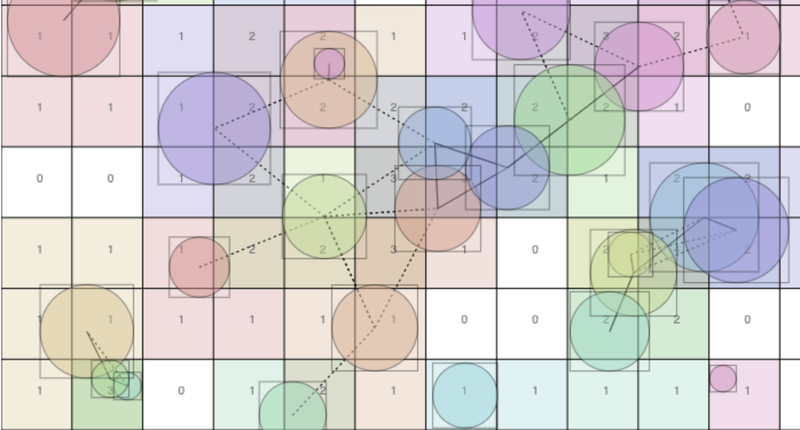 To do collision checking with spatial hashing, you divide the world into large grid cells (buckets). For each object, you find all the buckets that it approximately touches (it's okay to be overly inclusive, as long as you don't miss any) and add the object to each bucket's list of members. As you do, mark the object as potentially colliding with the bucket's existing members. After processing each object, you'll have a list of all potential collisions, which you can then process to filter out any false positives (things that fall into the same bucket but don't actually overlap). For most use cases, this process is very close to linear in speed, because most hash buckets can only fit a couple of objects, and most objects only touch a couple of buckets. In the demo above, you can see the hash buckets, as well as all the collision checks (lines between circles), most of which are false positives (dashed lines). As the hash buckets get smaller, the number of false positives diminishes, but the number of populated buckets increases. You can drag around the circles to see how they get hashed into different buckets. I chose to use bounding boxes around the circles to find which buckets they might touch because that was easy to implement and fast, but you could be more precise if you wanted to. Picking the size of the hash buckets is somewhat arbitrary. The smaller your buckets, the more fine-grained the bucketing is, and the less likely you are to have false positives. However, the smaller the buckets, the more of them there are, so it takes more time to put everything into its buckets and look through the bucket contents. As a rule of thumb, I tend to make my buckets slightly bigger than the size of a median-sized object. That way, most objects will land in between 1 and 4 buckets. However, if precise collision checking is very slow, it might make sense to use smaller buckets to trade off more bucketing time for fewer false positive full collision checks. If it really matters, don't rely on your intuition, profile the code! Alongside Verlet integration, it's very useful to be able to solve systems with multiple constraints. A common example would be a constraint that two objects can't overlap each other, or that all objects must be within the bounds of the screen. In order to solve a constraint, you need to calculate new positions for the objects that satisfy the conditions of the constraint. For a single constraint, this is often very easy (e.g. to solve the "stay on screen" constrain, you simply clamp the position's values to a specified range). The stiffness parameter controls how aggressively each iteration attempts to solve each constraint. If the stiffness is at its maximum, each constraint is solved fully on each step, but this can cause a sort of ping-ponging effect when solving one constraint makes another constraint worse, like if one circle is sandwiched between two others. Relaxing the stiffness makes each step move only part of the way towards a solution, which has the effect of making the circles a feel little elastic. With a lower stiffness, the simulation tends to be less erratic, but you might end up with some of the constraints being not fully satisfied (which is bad for rigid objects like rocks, but more realistic for soft objects like people). The sorts of constraints you can implement are bounded only by your imagination and your ability to write code that takes an incorrect state and outputs a correct state. You can have no-overlap constraints for arbitrary polygons, joint constraints for limbs, hinges, or chains, mouse dragging constraints, path-following constraints, or constraints that make things line up in a tidy grid. This is just one way to use these techniques, and I encourage you to look for other creative ways to combine these snippets with other useful ideas. Innovation is almost always the result of combining existing ideas in creative new ways: Hashing + collision detection = spatial hashing, mix() + color = gradients, Verlet integration + iterative constraint solvers = physics engine, golden ratio + color hue = color generator. The snippets presented here are the sort of self-contained ideas that I've found to be very good at combining with other ideas. This page has been viewed ~2.3K times.